George Michael was always mindful of the dreaded situation of his brother Henry imprisoned in New York. During this time, George Michael “… by labor, loans, and by selling property left to him by his father, procures money from time to time and finds means to convey it to the Commissary of prisons in his brother’s behalf." 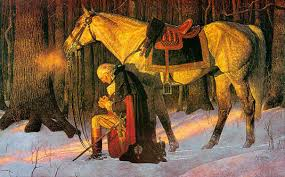 Gen. Washington and his army went into camp at Valley Forge during the winter of 1777-1778. No doubt the Berkeley County Virginians under Col. Wood shared the privations of that most trying winter.” During the hardships that winter, George Michael Bedinger, provided what aid and comfort he could by taking wagon loads of winter clothing, blankets and other supplies to Washington’s troops at Valley Forge. [ii] Dandridge, Danske, 1910, Historic Shepherdstown, The Michie Company, Printers, Charlottesville, Virginia, 389 p., pp.185-186. [iii] Dandridge, Danske, 1910, Historic Shepherdstown, The Michie Company, Printers, Charlottesville, Virginia, 389 p., p. 186.